Light and not too sweet. You can vary the amount of cherries if you wish. I was to the grocery store last night to “forage” for my dinner. I was being lazy. I didn’t want to cook anything. The crust will come together nicely. But fate intervened when I got home. I opened up the refrigerator door and what was staring out at me with a look that can only be described as utter abandonment? A 3/4 full container of Balkan-style yogurt. I had forgotten about it entirely. So I had only one recourse: to mercifully dispatch it to heaven. Or into a pie. They’re the same thing if it’s a good pie. I had read before that you could substitute yogurt for milk in a custard, but I wasn’t sure exactly how. Do you remember the cherries? I haven’t forgotten. 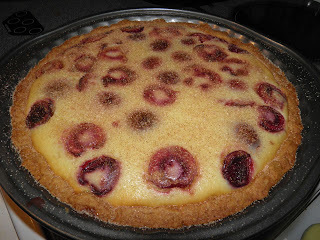 There’s a French recipe for cherries in custard called Clafoutis limousin. It’s amazing. As the name suggests it hails from the Limousin region of France. 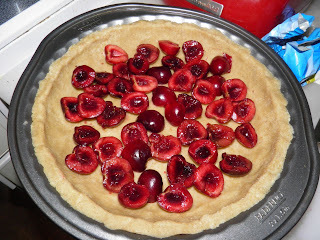 It’s essentially a no-crust flan that is baked with cherries. It sort of forms a very slight bottom crust as it bakes. I went a little light on the cherries because one of us isn't a great fan of them. You can add more than recommended if you wish. Traditionally the recipe contains the cherry pits as well, but who likes pits in their custard? I understand that the reason they are left in is that they impart a stronger cherry flavour when baked in the pie. So those were my inspirations. Insistent yogurt, an unexpected sale, and a love of a French dessert that I haven’t made in far too long. The crust on this is more like a cross between graham cracker and shortbread than anything else, so I didn’t really get the flaky pastry I was after to begin with in the grocery store. But I’ll settle for this. It sort of reminded me of a cheesecake but not as creamy or sweet. Place the flour, cinnamon, baking powder and brown sugar in a food processor bowl. Process until well mixed. Add the butter and egg and process until the dough holds together. Press the dough into the bottom and sides of a 9-inch pie plate. Bake for 10-15 minutes, until slightly browned. Let cool. 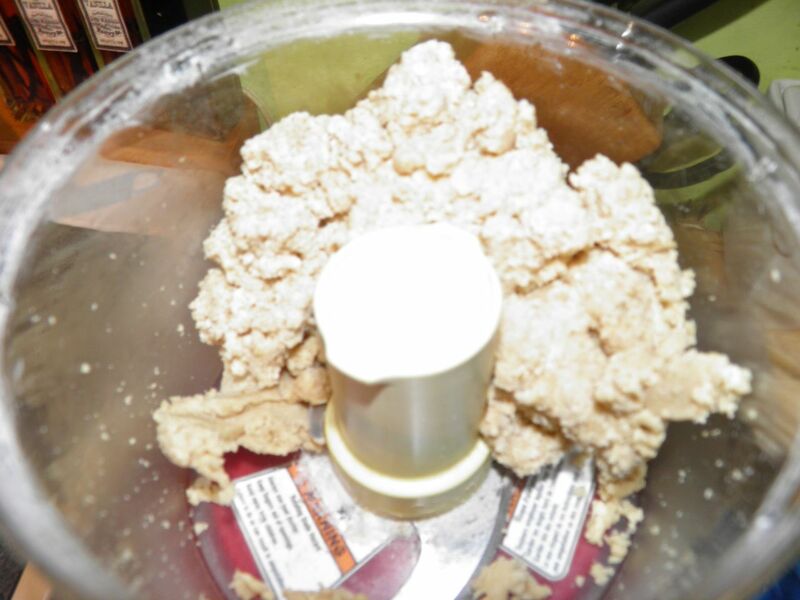 Place the yogurt, vanilla, eggs and sugar in the food processor bowl. Pulse until well mixed. The add the eggs, flour and salt and pulse again. Pit and cut the cherries in two. Arrange on the bottom of the crust. 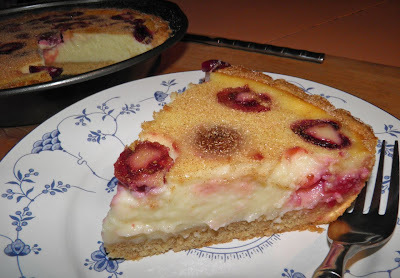 Slowly pour the yogurt custard over the cherries. Bake in the centre of the oven until set (just slightly jiggly in the centre), between 45-55 minutes. Mix together the cinnamon and sugar and dust the top of the pie. Let cool completely before slicing – several hours, or refrigerate overnight.